Abstract: A passive heatsink is always going to be the worlds one and only zero noise producing cooler, but the real prize is the zero noise active heatsink. I'm always impressed when a new type of heatsink comes out to try and solve the age old issue with noise production. The trick really is to make the heatsink thermally efficient without sacrificing acoustic concerns. Noise is important, but if the heatsink doesn't cool very well what use is it? Ultimately, low noise heatsinks are all about a trade off between how quiet the heatsink is before it becomes ineffective as a means of active cooling. A passive heatsink is always going to be the worlds one and only zero noise producing cooler, but the real prize is the zero noise active heatsink. Active and passive heatsinks make the distinction between heatsinks which have fans that mechanically move air over the fins surface, and those which rely on convection. Convection cooling requires much more surface area to generate the same level of cooling as a smaller actively cooled heatsink and is often impractical for close environments like the insides of our computers. Arctic Cool have created a heatsink called the Super Silent 4 Pro to address many of these issues. The Super Silent 4 Pro does this with the aide of a rather unique spin on traditional fan design. The motor is suspended above the fan, and the impeller blades are positioned below almost touching the tips of the fins. The cooler looks odd, and somewhat like an industrial fan used in ventilation situations. 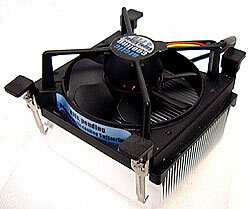 The fan spins at 2600 RPM and is reportedly designed to produce less of a hum. As if the Arctic Cooling Super Silent 4 Pro we're already unique enough, four foam rubber pads separate the fan/fan shroud assembly from the aluminum heatsink to help reduce vibrations. Whether or not these little foam rubber pads are thick enough to actually absorb vibrations from an unbalanced fan motor is up for debate. They are useful in reducing any rattle due to a loose fan mount however.